The Gear 2 Neo arrived yesterday in the post, so last night it got fully charged and then synced to my S5. The process was rather simple. Download the Gear Manager from Samsung Apps. Install. Turn on Bluetooth. Open app. 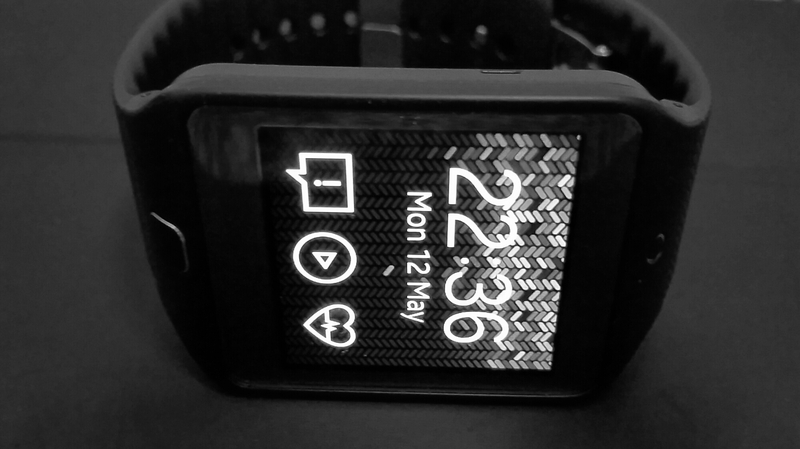 Press front home button to turn on the watch. Pairing process completes. And voila. Next you are faced with 2 firmware updates for the Gear 2 Neo, which happen one after another. The Neo is the camera less version and full plastic but costs £80 less,than the full metal bezel and camera included version. I had the original Galaxy Gear, and in my brief time I had the Gear 2 Neo it is a vast improvement from both the software and hardware. On the software side the watch runs Tizen. The hardware now has changeable straps, which Samsung has made easy with a pull spring mechanism inside the included strap. Going back to the software, the Gear 2 Neo runs really smoothly. It has a built it music player to play back via Bluetooth headphones music direct from the watch, and many other refinements. Notifications are much better handled. S Voice on the watch is leaps ahead than on the phone. Extras from the heart rate monitor and TV remote blaster all make this a great watch….. Or do they? First, the apps in Samsung’s app store were rather meagre vs the Galaxy Gear which whilst poor still , did have more options. Android Wear which is Google’s smart watch platform is about to go live and will offer far better app support. Developers are more likely to support this too. Next and most fundamental, the strap did not fit me. I am a big guy and I imagine for most people it will fit just about. But to me that was an oversight. However, it definitely was an improvement over the original Galaxy Gear so if you are a true all out Samsung fan person, then go for it.